Margot Amitrano is currently an undergraduate student in bioresource engineering at McGill University in Montreal, Quebec, Canada. 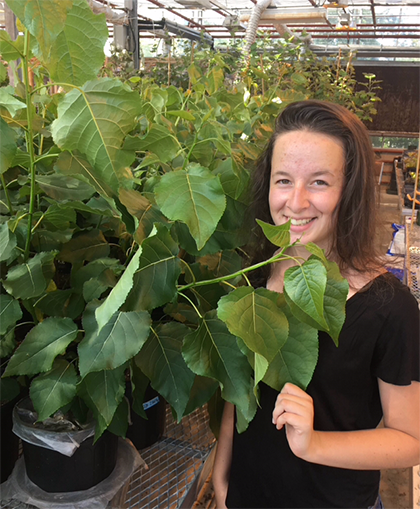 She just finished her internship studying the potential use of poplar trees in wastewater treatment with Heidi Gough at the University of Washington. On top of her studies, she works in a food microbiology lab at McGill’s department of food science. She previously studied food engineering in a Classe Préparatoire aux Grandes Ecoles in Orléans, France. As someone who grew up all over the world, she hopes to continue travelling and she also loves reading, cooking, playing soccer and listening to music. 1.) What made you interested in doing an internship studying poplar? During my studies, the courses I took made me become very interested in the process of wastewater treatment. When the opportunity presented itself to study wastewater treatment from a completely new angle, I could not have been more excited. Working with poplars as an alternative in wastewater treatment immediately caught my attention for being, to me, such an original idea. 2.) What kinds of research activities have you been doing for your internship? For my internship, I had to first plant poplar tree cuttings and water them for a couple of weeks until they were starting to grow well. Then began the experiments: I have been preparing contaminated water by mixing plain water with a liquid fertilizer and watering the poplar trees with varying hydraulic loadings. After a day had passed, I would collect the water that had leaked out of the pots in which the poplars were growing as well as soil samples and test for nutrient concentration in order to see if there had been a decrease from the input. 3.) What have been your favorite experiences so far this summer? A highlight of my summer so far was at the very beginning when I was first starting to grow the trees. I was unaware of the fact that poplars grew at a very rapid rate. Once the tree cuttings were planted, they began growing branches and leaves in a matter of days and in two months they were close to one meter tall. When arriving in the morning, it was always very exciting to see how much they had grown. Another great experience was at the AHB field tour in Chehalis, it was really interesting to meet so many other poplar enthusiasts. And, since I’m not from Washington, it was nice to visit Seattle and a bit of the state. I have a year and half left to finish my undergraduate degree and I hope to do a master’s degree once I graduate. I am still unsure about whether I want to pursue my initial path and study food engineering or if I would prefer to continue in environmental engineering, but my internship definitely made me lean more towards the latter.